"A National Day of Giving"
The BIG Day of Giving is a 24-hour giving challenge! It is a national, collaborative day of giving to non-profits within 24-hours to give where your heart is. We've joined up with Sacramento region GiveLocalNow and El Dorado Community Foundation GiveWhereYouLive. 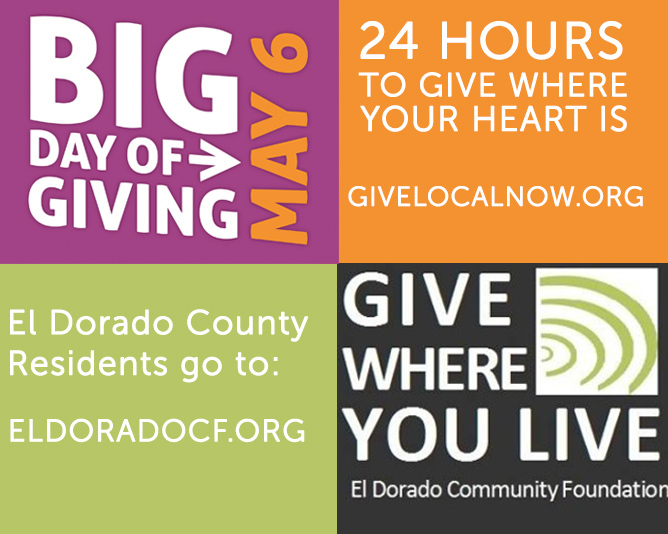 Today, El Dorado County residents can give to us by visiting eldoradocf.org. Residents outside of El Dorado County can give to us by visiting GIVELOCALNOW.ORG and donate to All About Equine Animal Rescue. Via text messaging AAE on your phone to 5500, (please note that messages and data rates may apply). To donate via phone enter 55000 as if it were a phone number, and then put Equine into the message body. It doesn't matter if it's in all caps or not. An automatice response will be sent to your phone with a link to the 'AAE' giving page. Donors can donate as many times as you want on this day to as many nonprofits you wish using the number 55000. You can also donate by dropping by the El Dorado Community Foundation Office at 312 Main Street in Placerville and at El Dorado Savings Banks throughout the county. Please make checks payable to All About Equine Animal Rescue.